Greece has a long history stretching back thousands of years, and during that history has been invaded many times (including by the Ottoman Turks who occupied the country for 400 years). 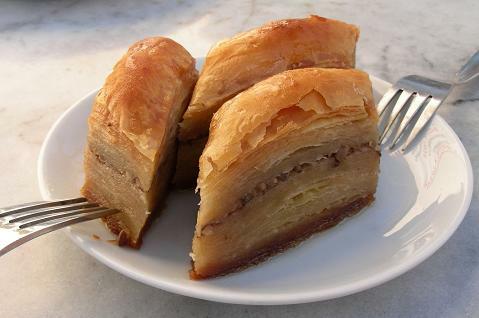 As a result, Greek cuisine has absorbed influences from many sources, and some dishes (baklava and moussaka) are shared with and have Turkish names. Greek cuisine is not just moussaka. While lamb is a traditional meat, favored for holidays and festivals, poultry, beef, and pork are also popular. 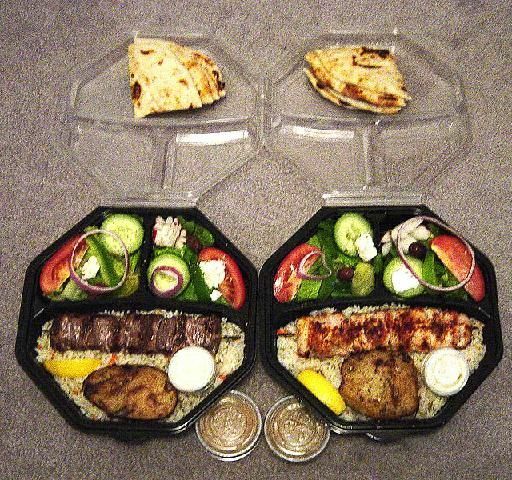 Additionally, with Greece including many islands, and with no part of the Greek mainland more than 90 miles from the sea, fish and seafood are also Greek favorites. Greece's climate is favorable for growing of both olive and lemon, and these form an important part of Greek cuisine. Vegetables include aubergines and courgettes. Garlic, basil, oregano and thyme are widely used to add flavor to dishes. And finally, and by no means least, is Greece's famous feta cheese. Baklava - A sweet pastry made from layers of phyllo dough, with chopped nuts and sweetened with sugar or honey. Dips - often served with Pita (unleavened) bread - including: Hummus (chickpea dip), Melitzanosalata (eggplant dip), Skordalia (garlic sauce dip), Tahini (sesame paste dip), Taramosalata (carp roe dip) and Tzatziki (yogurt, cucumber and garlic dip). Dolmades - Grapevine leaves stuffed with rice, vegetables and sometimes meat. Keftedes - Fried meatballs with oregano and mint. Kleftiko - Lamb marinated in garlic and lemon, and then slowly baked on the bone in a pit oven. Moussaka - Layers of minced meat and sliced eggplant and tomato, topped with white sauce and baked. Souvlaki - A skewer of meat, fish or shrimp which is cooked on a barbecue grill. 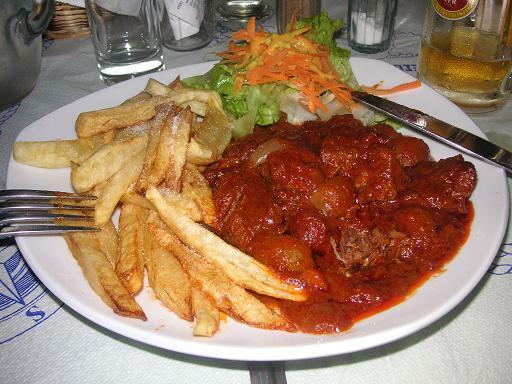 Stifado - A beef and onion stew with red wine and cinnamon. 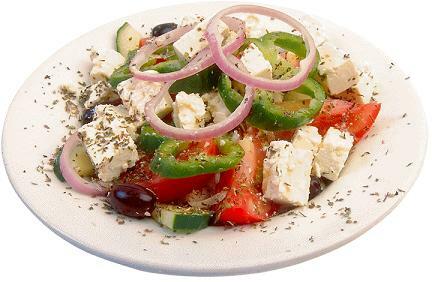 Village salad (generally known outside of Greece and Cyprus as "Greek salad") - A salad of tomato, cucumber, bell peppers and red onion, seasoned with salt, black pepper and oregano, and dressed with olive oil. Feta cheese, capers and olives are sometimes added.